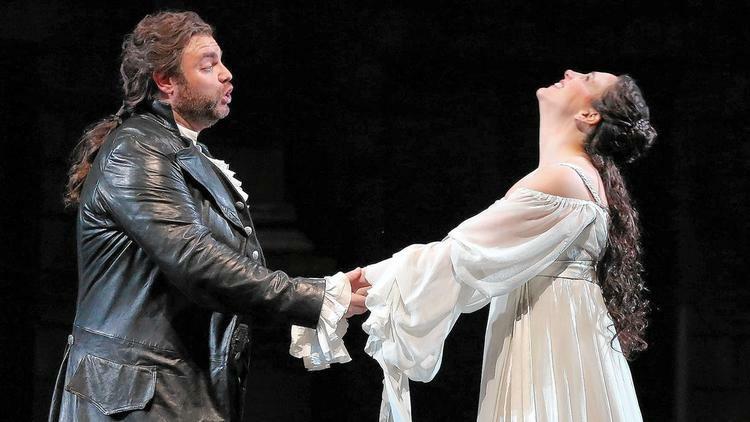 Review “Romeo and Juliet” (Lyric Opera): The Greatest Love Story Ever… Sung! Lyric Opera of Chicago presents ROMEO AND JULIET. At the Lyric, I’m gotten fairly adept at reading the English titles while watching the opera. This time because I’m very familiar with ‘the greatest love story ever told,’ I chose to ignore the printed translation and just experience the opera. I focused on the emotion of the music to connect me to plot points. And it worked. Except for the occasional habitual glance up, I was transfixed by the passion unfolding on stage. I immersed myself completely in the beautiful French singing. Unusual for the Lyric, the curtain rises before the 7:30 start. It almost seems like an error as stagehands set the last chairs with the audience looking on. Director Bartlett Sher boldly starts the opera in silence. Performers, one by one, silently and stoically enter and position themselves as a somber crowd. Sher’s decision is attention grabbing. It’s completely quiet. The orchestra doesn’t start to play until the stage is filled. In contrast to the muted entrance, Costume Designer Catherine Zuber fills the stage with eclectic vibrance. Ladies dressed in elegant finery mingle in with individuals dressed in vintage carnival wear. Once the entire village has assembled on stage, the prologue begins. The ensemble sings about the well-known feud between the Capulets and Montagues. The love story captivates from pre-prologue through the deaths of the Susanna Phillips (Juliet) and Joseph Calleja (Romeo).Phillips and Calleja ignite the stage with their steamy flirtation. Each makes a fairly playful entrance. Phillips frolics as the belle of the ball. Her cotton-candy pink gown makes her the center of attention. The commanding Calleja swaggers in with his fellow party crashers. They aren’t looking for love at first sight but when they spy each other. That’s all he wrote. The love is legendary. And the singing is too. Phillips and Calleja perfectly embody the hearts and the souls of the famed lovers. Their chemistry seems genuine. After Phillips struggles to leave Calleja, she promptly returns for one last embrace…again and again! Their desire smolders to an almost embarrassing level. I’m enviously gawking and feel like a peeping tom. Charles Gounod matches Shakespeare’s tale with a sweeping, timeless romance. Under the steady baton of Conductor Emmanuel Villaums, the tempo goes from merry antics to love declarations to spirited confrontation to eternal devotion. Aside from the main love story of Phillips and Calleja,there are splendid supporting performances throughout the opera. The sprightly Marianne Crebassa (Stephano) sings a beautiful, mocking serenade during Act 3. In addition, Deborah Nansteel (Gertrude) brings a delightful combination of moxie and maternal to the nurse role. ROMEO AND JULIET takes the Shakespearean classic and makes it into the greatest love story ever sung.